This morning started out uneventful. I dropped my son off at a school event and then decided to take advantage of the trade winds by taking a morning stroll with my camera. It was such a nice day that I took longer to explore than normal. Yet, I was just about to return home when I noticed her out of the corner of my eye. Abnormal coloration in birds: Melanin reduction « Sibley Guides. It seems that birds can have decreased melanin causing coloration changes. My bird is likely a Red-crested Cardinal. Read Cardinals not always redbirds | The Columbus Dispatch to see photos of two other birds who have different coloration related to this. Whether these differences are just a fluke or related to something larger is unclear. Still with humans having more problems with vitamin D deficiency and now birds changing colors due to melanin, it does make one wonder. Could they be related? Will we see an increase in birds of a different color? Honestly, I do not know, but I do know that differences are okay and evolving is not necessarily a bad thing. Today I’m grateful I saw this bird while I had my camera. I for one will continue to embrace differences. I hope you will too. It could be a baby bird, too. 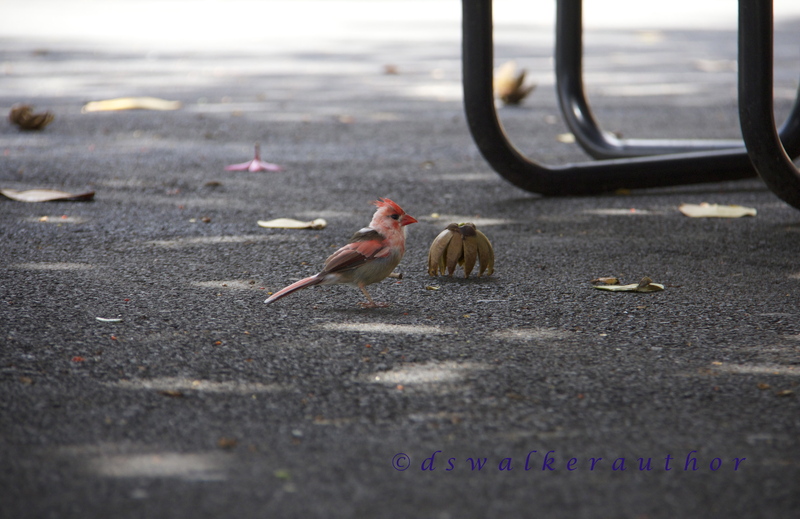 The juvenile cardinals are brownish and dull, and then they turn red when they mature. Maybe he’s still growing and developing. He’s not real red where’s he “red”, though, is he? I think you’re right about the abnormal coloration. I wondered about juvenile birds too and they can have color variations, but usually not this different. Although we do have a few Northern Cardinals on Oahu, most of our cardinals are Red-crested so the bill would not normally be red either.